Well Zayo thinks I am a customer... RIP, I TOLD THEM I PLAY THE GAME. Standard Cpoy/Paste response as a result of it being flagged to be investigated? Hey it's something. Says it's clean, then I would like to know why it shows that it drops through 3 / 4 nodes? There's definitely something in the routing for you. So that amount of variability is definitely not normal. I've noticed that the in-game ping displays quite differently from your actual ping. You can check this in resource monitor to get a better idea. I think that a lot of the problems stem from what the Net Ops team is saying, the servers aren't load balancing properly. @9E7PG37M9D I was actually able to get my ISP (Suddenlink) to troubleshoot the routing on my behalf, although I had to give them hell first. You may try that but be prepared for a fight. I know that my ISP totes low latency for gaming so that helped when I confronted them. 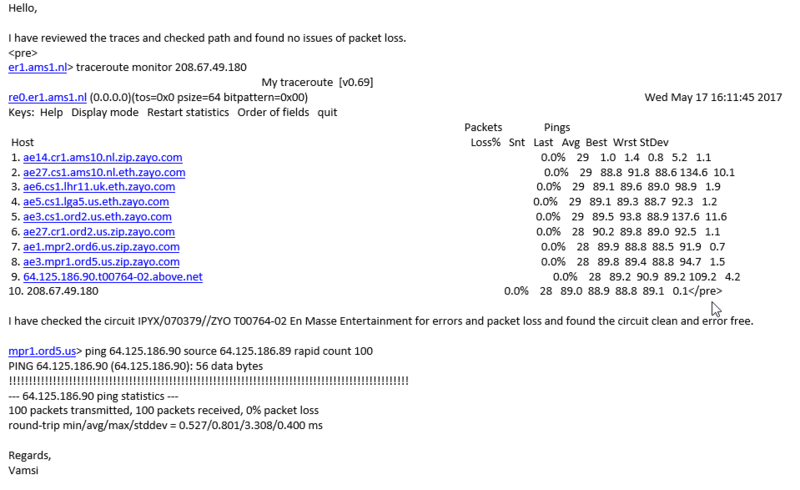 I also had 7% packet loss which is really bad. Judging from your tracert you route internationally and I'm not sure if your ISP will troubleshoot there but they might at least tell someone who can. Thank you everyone for reporting these lag issues to us and for helping us to investigate the ongoing problems. I posted an update to the thread with some information on this week's hotfixes. After the "hotfix" I am getting intermittent 5 second feezes, making the game totally unplayable. I am having issues still also. I ran new scans today. I know I will probably still have some lag even if EME/BHS can find a way to fix this just not sure I will continue to hope to see a playable Tera again. I guess thanks for at least trying. I will give you this--the hotfix today certainly did SOMEthing. Running Abscess on my Valkyrie was EXCITING. Every skill I triggered I had to wonder if it was gonna hit now, or sometime later. Tried to jump to the back of the slug (first boss) in Abscess--as I was waiting for it to trigger, he charged up and triggered his evil eye. Which, of course, staggered me and canceled my skill--so the next 3 skills which I had already hit fired off on thin air. Then I took a Valk into the Celestial Arena. Had the stage where you have the caymans with the bombs and the giant warthogs to "kill as many as I could"--froze up in there for over a minute. Apparently Tera was processing the skills I was firing off (nothing was moving), but when the freeze was up there was a loud noise of a bunch of skills firing off all at once, and then I was in the next stage--invisible hyenas and totems--and had been there long enough for them to completely surround me and kill me before I can get a skill off. The game is not playable like this. If your notion is that it is better for the server to be stable enough to stay up when it gets in trouble (by freezing our actions and letting the game go on invisibly) than it is to go ahead and crash so we can restart, maybe without dying, then you have lost all perspective. Ok, that is my rant, I am done now. I will be fine, thank you for asking. But the game is unplayable as it is. I will log in daily to maintain my buffs, but I will not participate in your Anniversary till you can fix this pile you just dumped on us. Thanks, thanks a lot. The lags for example in dungeons is affecting all players at the same time. Even if I'm in one dungeon and my guild mates are in other we still get the same ping spikes and lags that can go for seconds at the time. I'm glad I'm not the only one experiencing this, it was literally the worst lag I've ever felt in this game in years. I'm on FF and a lot of other people were also having problems there as well.